The arrival of the Seljuk Turks in Anatolia marked the beginning of a new era in history. After their victories in Iran and Mesopotamia, Turks rapidly spread throughout Anatolia, settling there in the second half of the 11th century. In 1071 the Byzantine emperor Romanos Diogenes, who was of Cappadocian origin, was defeated and captured by the Seljuk ruler Alparslan at Malazgirt. In 1080 Suleiman Shah founded the Anatolian Seljuk State, the capital of which was Konya. In 1082 Kayseri was conquered by Turks. 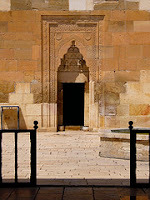 Cities such as Nigde and Aksaray were reconstructed, and caravanserais, mosques, Madrasah, and tombs were built. The Seljuk Turks’ conquest of Anatolia did not affect the administrative authority of the Patriarchy. It was only after the 14th century that its size and status were diminished.